A technology stack is a combination of software products and programming languages that form a logically complete platform to develop a web application. Applications have two software components: client-side and server-side, also known as front end and back end. Choosing the right technology stack for your web or mobile application development is half art and half science. 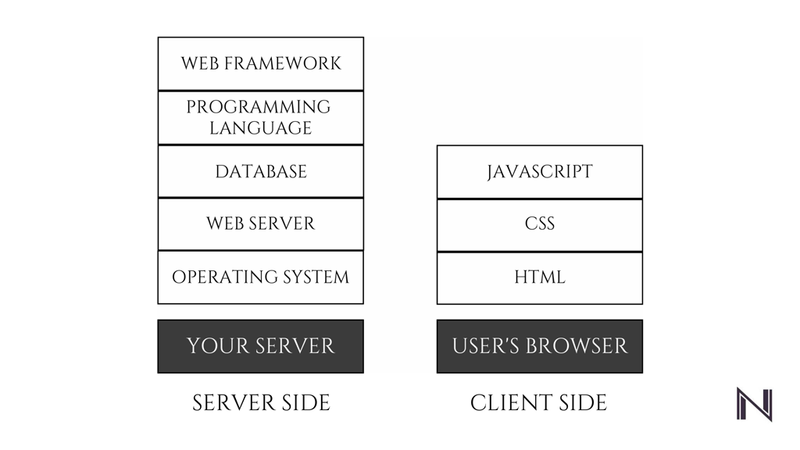 Each layer of the application builds on the features of the layer below it, creating a stack. This main image shows the main building block of a typical technology stack, and there can be other auxiliary components included as well. The back end consists of the business logic that drives your application. Users will never directly interact with the back end since all the data is passed through the front end. Web application development can be a hectic process, mainly when one lacks the essential tools to get going. While most choose PHP as their base language for developmental work, accompanying frameworks are surely a great way to ensure faster development in an organized manner. Also, the use of frameworks helps to implement better features. For websites that are coded in PHP, Laravel and CodeIgniter are the two of our preferred frameworks. Relational databases (RDBMS) like MySQL and MSSQL have been the major model for databases over the past few decades. Recently, non-relational databases like NoSQL have been gaining popularity. One must be careful when choosing a database for their web application. If your data is greatly relational in nature or will become relational as your web application evolves, we recommend using a relational database. If your web application uses an unstructured data model and don’t foresee any changes to the data structure, we recommend a NoSQL database. The availability of a development team plays vital role in determining the right technology stack for your business. Choosing a technology stack is a commitment that cannot be easily retreated, so concerns related to scalability and performance are common. NetFillip is a comprehensive development company with a team of skilled developers to deliver web applications that are easy to use, scalable, and offer superior performance. To know more, check out our services for PHP web application development, Laravel web application development and CodeIgniter web application development. Get in touch with our experienced team of developers to transform your ideas into a resourceful web application.